$10/pre-sold ticket includes materials, coffee, tea & snacks! Interested in learning how to create a picture with an innovative medium that is also your favorite drink – coffee? Come to one of our two classes led by Diane Clise, known for her expertise in coffee art, and produce a picture of your own to take home! Feel free to sip on some brew and paint too! Tickets are $10 online via pre-registration or $15 at the door if space is available. Ticket price includes supplies, instruction, coffee, and snacks. 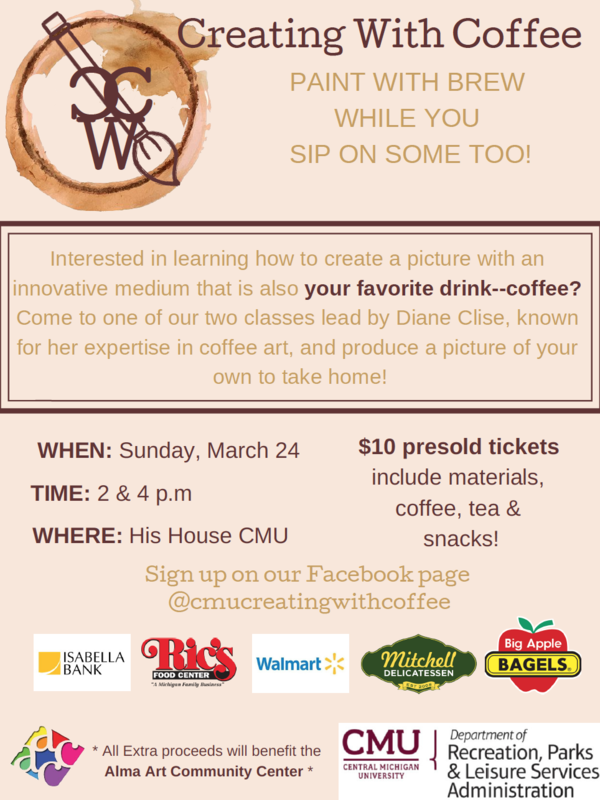 Space is limited so sign up on our Facebook page: @CMUcreatingwithcoffee. The program is presented by CMU’s Department of Recreation, Parks, and Leisure Services: RPL 430 Planning Recreation Programs and Events students. 2-3:30 p.m. & 4-5:30 p.m.
​and all extra proceeds will benefit ACAC. Alma College is hosting Arts United.